Here is a picture book that will send shivers down your spine with its eloquent beauty. Written by the half-sister of Barack Obama and inspired by the love and spirit of their mother, it evokes an ethereal and everlasting love that binds us all. Little Suhaila asks her mama what her Grandma Annie was like. 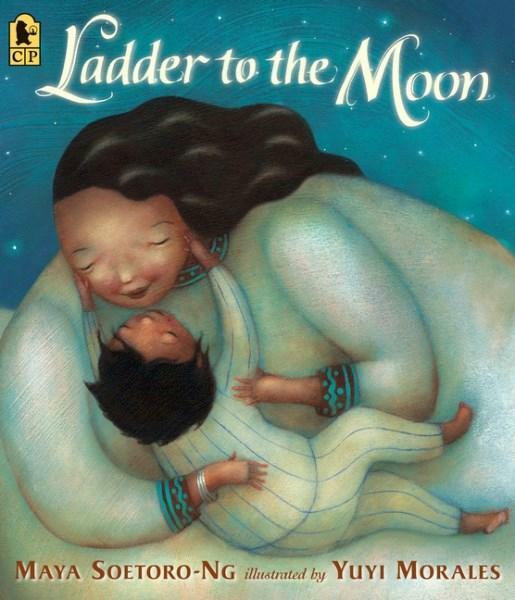 'She was like the moon' her mother replied, 'full, soft and curious…'. That night a golden ladder appears outside Suhaila’s bedroom. And there, on the bottom rung, is Grandma Annie. Together they climb the ladder to the moon. Suahila listens to the songs of the moon, and grows stronger. From the moon, they watch the people of Earth. Grandma Annie has a quiet wisdom about her. She knows how to hear those who need help. The powerless, the struggling, the lost. She teaches Suhaila to listen. To see. To taste the air. To know more than she did before. All those people who need us are people just like you and me, do you see? Grandma Annie shows those who need help how to climb the golden ladder and join them. She knows they are stronger than they realise. She tells the people that they can work together to heal, to build bonds, to create hope. The language is lyrical and rhythmic. It dances gracefully along the page creating a sense of calm and embracing you in its message of love and the human spirit. The soft and gentle illustrations by Yuyi Moralies perfectly capture the warmth and hope of the story. The beautiful and expressive faces climbing the golden ladder to the moon will move your heart and connect you with the real, everyday people searching for the strength to carry on. This is a story that touches on the greater spirit that connects us all and makes us human. It combines elements of fantasy and folk magic to convey a message of humanity and love that will stay with you long after closing the cover. The whole book leaves you feeling like you have been wrapped in a warm and beautiful hug that will sustain you as long as the moon shines above. Just stunning.